Alpharetta real estate sales tend to be more stable than some of the surrounding areas in Metro Atlanta because of the strong local economy, good schools, lower crime statistics and demographics so if we are seeing lower trends here, we would likely see them in other areas of Atlanta as well. But there is more going on here. 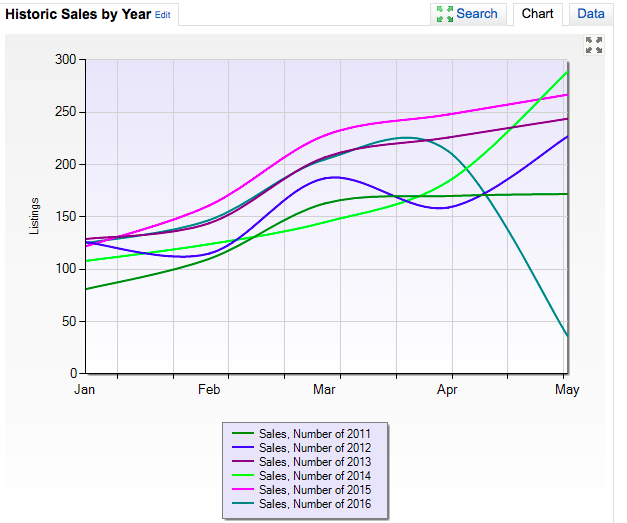 While sales volume is down, we can see that prices have continued to rise by looking at the chart below. So we see sales volume (demand) is down but prices are still going up. This is counterintuitive since we know that supply and demand are inextricably linked. Supply isn't high as you can see from the chart below so it's my opinion that something else is about to change. We know demand is down and supply is not up but prices have continued to rise thus far this year. Even with lower demand it seems that price may be a lagging behind as indicator of what is currently happening in the market since they are still rising. If the trend of lower demand continues, we are likely to see more supply remain on the market and more homes with reduced prices and listings that fail to sell. When that occurs, prices will likely begin to level off. Just taking the anecdotal approach to all of this, and talking to agents and buyers in the market, we seem to feel that it's difficult to find homes for buyers and buyers (at least the ones my team are working with) seem to have a hard time finding homes at prices they feel represent a good value. All in all there doesn't seem to be any reason for panic but maybe it's time for a slight correction in the area of price. More and more buyers looking at homes in the range of the median price in Alpharetta are having a hard time shelling out the money for homes at current prices. We hear more buyers saying they will wait. Prices seem too high for what they are seeing in the market. No one can say for sure what the future holds but the statistics indicate a change is coming and that change may just be some price adjustments to the inventory of homes not only in Alpharetta but in the other major sub-markets of Atlanta. Excellent article. 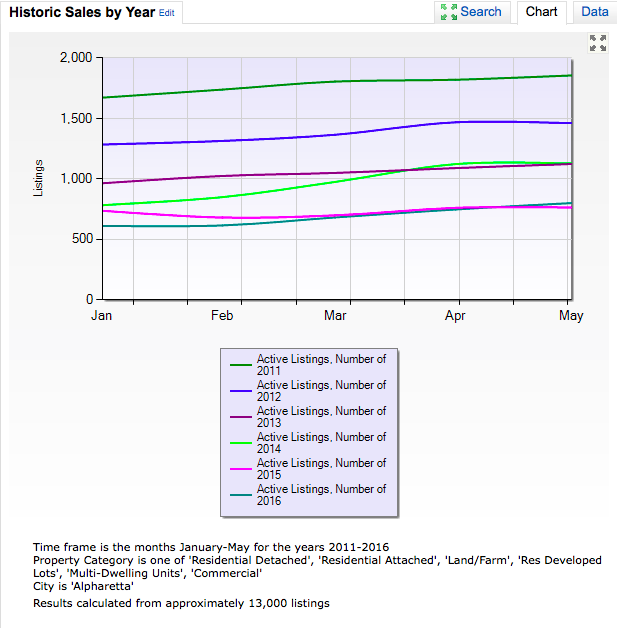 I am a buyer who has been patiently waiting and watching the housing trends in Alpharetta. Indeed, it doesn't seem realistic for prices to continue to climb despite homes being so incredibly overvalued. 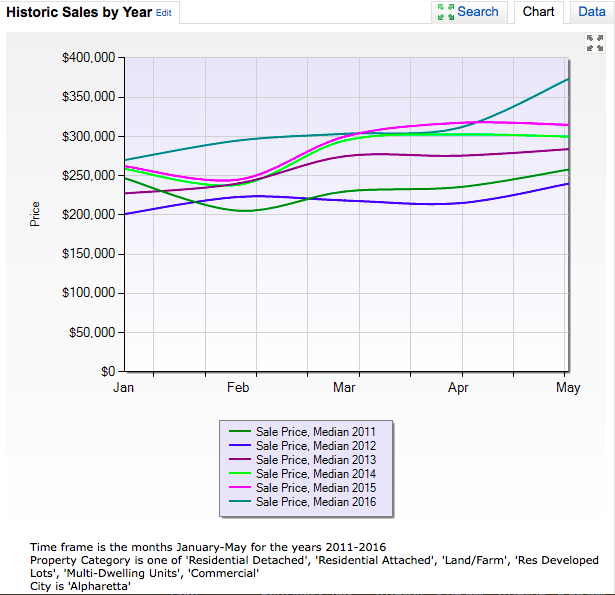 Week after week, sales seem to stagnate, yet listing prices have been climbing. I believe that this is probably "momentum" fueled by overly optimistic early predictions for 2016. But if the current trend continues, I don't see how this could continue. Supply is up, demand is way down. Sale prices should reflect that. We're hoping that by mid-late summer, prices will start a downward trend and the market will start swinging in the opposite direction in favor of the buyers. Of course, that may be an incorrect prediction, but unless that happens, we will continue renting or buy a home elsewhere. Thank you for the comment Robert. I do think we are running on the optimism from earlier in the year. However, I can't see prices dropping much in the next couple of years unless something happens with the economy that sees us in a major economic downturn. What is likely to happen is a leveling off and perhaps a minor correction in the 2%-3% price change downward. Overall, the market is still very strong so it's likely that waiting won't save a lot of money but if you are careful and diligent, you might find something a little below market value if you can find the right seller at the right time!